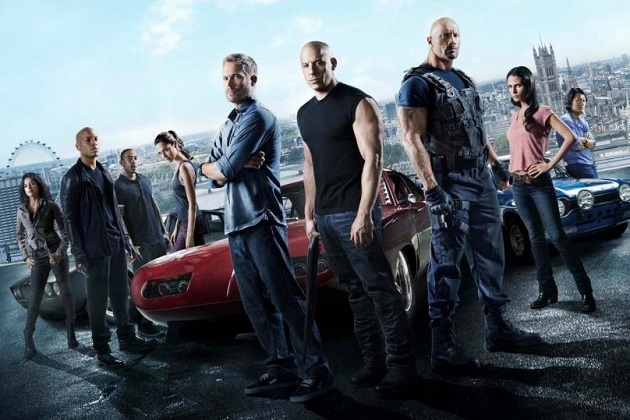 Into the void of PG-13 summer action sprang forth the 6th film in the Fast & Furious franchise. There is a point to all of this speed and fury, I am sure of it. To date, the most interesting point in the series happens in the credits of this film, which harkens back to the 3rd, seemingly throwaway episode, Tokyo Drift. The rest of the films have been a progression from “…stealing DVD players, trades up, ends up heisting over $100 million in Rio,” as stated so eloquently by the film’s generic bad guy, Owen Shaw, played with almost no memorable traits by Luke Evans. Evans has the ability to be great in films that should be mediocre (The Three Musketeers) as well as the ability to hide his charm completely (The Raven). Here he is all charm no greatness. What he does have is a fast, flat car with tires that don’t pop when flipping bigger cars. The car doesn’t slow down at all, either. That’s the movie, though, isn’t it? Muscle cars, and musclebound guys. Both facets are most capably represented in the form of Vin Diesel, who is at home in all the glorious hogwash. He rips through the clichéd script and action sequences with a beautiful smugness that shows he is in for the ride of his life, even if it comes in 20 parts. Judging by the struggle he’s had to make Riddick into a practical commodity, it make take 20 parts to keep his other projects going. Truth is, as powerful of a supporting cast as is present in the Fast & Furious series, none of the other cast, outside of Johnson, have the ability to carry a film. In this way, it’s kind of a supporting actor’s version of The Expendables. That might be cutting it a little or a lot short. The latter series is a continued act of desperation to salvage the career of Stallone, whereas, the Diesel series feels more homogenous, and like there is an overall plan, even if the scripts are rip offs of films like Point Break, The Italian Job or The French Connection. At this rate, the next theft should be Citizen Kane. Paul Walker and Jordana Brewster look like an awesome runway couple. It still doesn’t look like she’s had a baby, and I haven’t seen either of these kids in anything outside the series since it started. Walker get’s his own sequence inside the clink here, and even if it is a bit superfluous, it still looked cool. Gibson has the Transformers series going for him, and he may be approaching Samuel L. Jackson numbers in the next decade if his luck holds out. My favorite scene in the film occurs when he and Kang get their asses kicked by one bad guy. It takes a confident pair of actors to not be the swiftest onscreen and still keep smiling. Chris Hayes doesn’t do much this round. He’s there to figure stuff out on computers and exuberantly remind the rest of the crew when things are not going well. I’ll take that. Michelle Rodriguez is back, with the requisite memory loss required for many characters who die off-screen. There is a pleasure to behold when she goes up against MMA fighter turned actress, Gina Carano. The first one is a draw. I will give you one guess who wins the rematch between the girl Girl Fight and the mentor from Fight Girls. Dwayne Johnson doesn’t do much here but glower, trade clichés with Diesel and fight the big guys. That leaves Evans for Diesel in the end. Let’s be frank, this stuff is crap. The amount of tough guy language uttered in this film make Die Hard 2: Die Harder look like Bard. For all the talk of family, going it alone, and this one’s on me, there is the feeling of comfort food. It makes you dumber, bit by bit, but it also feels good. I haven’t tried watching any of the films twice, though. I don’t want to risk Cabin Fever in my homey utopia. Owen Shaw: You know, when I was young, my brother always said, “Every man has to have a code.” Mine: Precision. Use what you have, switch them out when you need to until you get the job done. It’s efficient. But you? You’re loyal to a fault. Your code is about family. It makes you predictable. And in our line of work, predictable means vulnerable. And that means I can reach out and break you whenever I want. Dominic Toretto: At least when I go, I’ll know what it’s for. Next Post R.I.P.D. : Because there has to be one actor that can’t succeed.